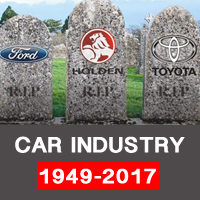 What the death of the Australian Car industry means for you. For 90 years, we have proudly built cars here in Australia. Ford and Holden have been fierce rivals on the race track and on our roads. Industry pundits are saying that for the first time in 130 years (since the automobile was manufactured), we are now starting at square one. What this means, is that in 30 years time, we probably won’t be driving Ford or Holden, but Telsa and Apple! But for now – what happens next year for the average motorist? Obviously all our vehicles need to be imported. I can see that there will be two main problems. a) Australia will be FLOODED with what we call ‘grey imports’ – legally imported new and used vehicles, but through channels other than official dealers. No, while I’m not a fan of dealers, at least we can get parts from car dealers. If you buy a fancy car from Japan, you might be stuck with a car that you cannot buy parts for. Parts can be difficult to get, they can take 4-6 weeks to arrive and what if they send the wrong part? b) Dealers are forced to bring cars that are not suitable for Australian conditions. Holden are already advertising the many models that they will bring in. This is not good. The last few models that Holden have imported, particularly from Europe are simply not good enough. They work ok in – 40 degrees C, but not + 40 Degrees C! Both grey imports and overseas cars are cheap upfront, but maintenance and repair costs WILL be higher – and many motorists tend to blame the poor old mechanic for this. But the onus needs to be on you – the consumer. Buyer beware. Talk to a mechanic BEFORE buying a car. Don’t buy the first one that syncs to your iPhone the best. Don’t buy the red one because its your favourite colour. There are many more factors in buying a car than a salesman will let on. Give me a ring anytime during business hours, and I’ll talk you through the best car to buy.